Mitt Romney’s lack of qualifications to handle economic matters appears to be exceeded by his incompetence in foreign affairs. Fortunately for the reputation of the United States, he is being referred to “Wannabe President” by the Rupert Murdoch tabloid, The Sun, which is running a headline of Mitt the Twit. It is far better for this to come from a “Wannabe President” than an actual President. 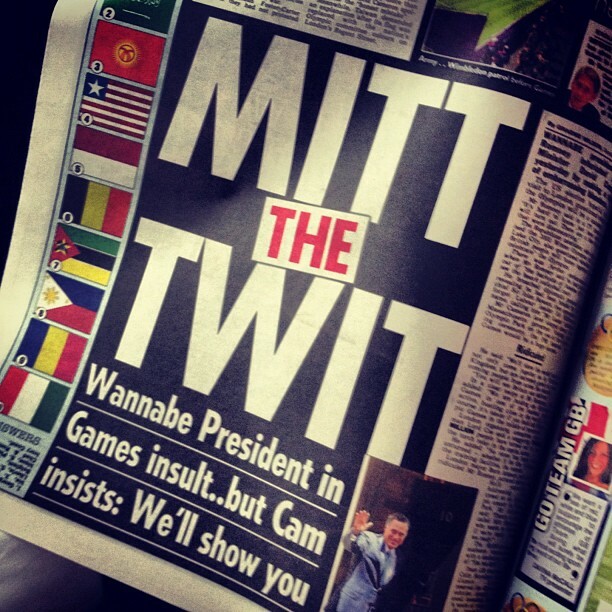 If only Murdoch’s media outlets in the United States would adopt the nickname given to Romney by The Sun. Other British publications are comparing Romney negatively to both George Bush and Sarah Palin. I have no doubt that Mitt Romney is more intelligent than Sarah Palin, but this cannot be seen from Romney’s stream of gaffes while in Great Britain. England is just a small island. Its roads and houses are small. With few exceptions, it doesn’t make things that people in the rest of the world want to buy. And if it hadn’t been separated from the continent by water, it almost certainly would have been lost to Hitler’s ambitions. Yet only two lifetimes ago, Britain ruled the largest and wealthiest empire in the history of humankind. Britain controlled a quarter of the earth’s land and a quarter of the earth’s population. I have to tell you. This is Ann’s sport. I’m not even sure which day the sport goes on. She will get the chance to see it, I will not be watching the event. I hope her horse does well. WTF? If your spouse’s horse were in an Olympic contest, would you not even watch? This is either a fib, designed to insulate him from whatever minimal fallout there is from owning a dressage horse; or it’s true and he’s just unlike other human beings. I mean, Obama makes sure he sees his daughters’ high school sports games. But Romney won’t even watch his wife’s horse at the Olympics? A bizarre response such as this does more harm than another reminder of Romney’s wealth, which is well known. I see this as another example of how Romney will say anything he believes will help him without any regard for the truth. Saying that he is unaware of when the event is and that he will not be watching does not have any bearing on what Romney actually knows or whether he already plans to watch the event. Rupert Murdoch Gave $1 Million To The Republican Governors Association–Are You Surprised? Liberal blogs have spent the day acting shocked that News Corp, owner of Fox, contributed $1 to the Republican Governors Association. Don’t believe them. They are no more shocked to read this than Captain Renault was shocked to find that there was gambling going on at Rick’s in Casablanca. Do I have draw this out on Glenn Beck’s blackboard? Fox, the Republican Party, and the Republican Governors Association are all parts of the same organization. Fox is one of the main propaganda organs for the Party. It’s just like how Pravda, the Communist Party, and the government of the USSR were all the same group. Pravda and Fox have the same function in promoting an authoritarian political party. It was like an interdepartmental shift of money. So really, there’s nothing all that surprising about one arm of the conservative movement moving some money to another. It’s not even anything new. Rupert Murdoch gave $1 million to the California Republican Party in 1996. “Glee” was already in hot water with the right wing, since the show’s creator, Ryan Murphy, had in previous episodes made fun of abstinence education and, as Newsbusters puts it, “tried to normalize teen homosexuality.” Apparently on the right, treating gay kids as regular folks, instead of as scary deviants, is cause for alarm. “Glee” is millions of dollars of sound and fury aimed squarely at your children. And as we can now see, the creators are all about getting between you and your kids with their political and social agendas. They know Palin is a growing political force and nothing’s off the table when it comes to marginalizing her — even at the expense of their own show’s entertainment value — even at the expense of audience share. Poor Ryan Murphy. I guess it would’ve been oh-so-much simpler if he’d just had Jane Lynch tell the silly cheerleaders that they were the dumbest teens she’d ever seen. And that was saying something, since she’d once taught cheerleading to … Megan Fox. 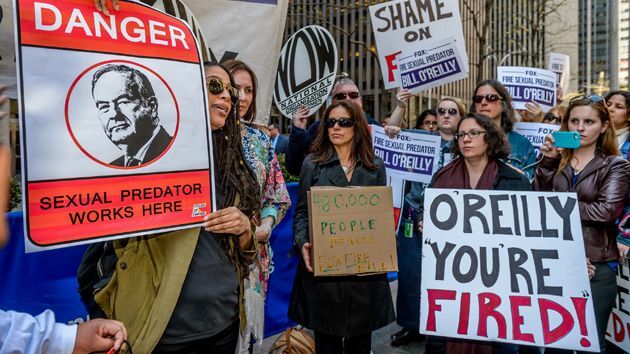 It would’ve gotten a nice knowing laugh without prompting any hysterical shrieks of angst from the right-wing blogosphere, which is so paranoid about Hollywood’s oppressive Marxist-Obamaism that it seems bent on getting worked up every time anyone in show business shows any signs of liberal bias. But guess what? I’m betting that Murphy is a liberal and he liked the idea of a Sarah Palin joke. The same goes, in reverse, if you listen to right-wing-dominated talk radio, where you can hear Rush Limbaugh, pretty much any day of the week, making jokes about his favorite liberal whipping boys. Ditto for Fox News. The conservatives rule talk radio and cable TV, the liberals rule Hollywood and that’s the way it goes. What I did find intriguing is that in all the attacks on “Glee,” none of the conservative bloggers got around to mentioning that, despite their constant drumbeat of charges that regular Americans don’t like Hollywood leftist entertainment, “Glee” is a huge hit, with its Tuesday night show drawing 13.7 million viewers, a huge leap forward from the average viewership of its first 13 episodes. And even more intriguing, the conservative bloggers somehow forgot to mention that this leftist propaganda show is, ahem, airing on Fox TV, which is owned, ahem, by arch conservative Rupert Murdoch. Does that make Rupert a traitor to the cause? Or is he one of those conservatives who actually believes in creative freedom, where show-runners can offer their own special slant on the world as long as they attract enough eyeballs to have a hit show? Does that make Rupert a turncoat? Or is he just the kind of guy who, when it comes to entertainment, believes in different strokes for different folks? As Madrak points out, “the creative, talented kids have always sniped at the dumb cheerleaders.” And intelligent people have mocked Sarah Palin ever since she became known nationally, and will continue to mock such a dumb former half-term governor. Yet one more thing is true. Conservatives will always complain about how they are the victims.